It is most likely that nearly everyone reading this enjoys the taste of potato chips. On the other hand, they are obviously one of the most toxic processed foods you can consume, whether they’re created from actual potato shavings or not. 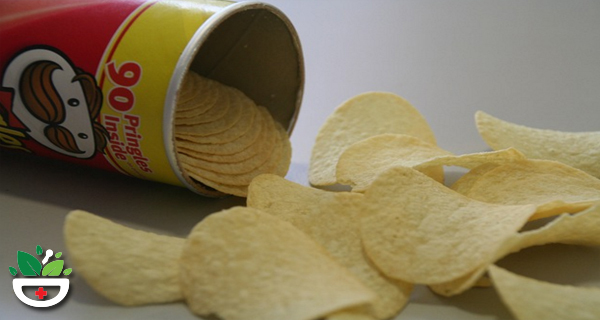 To be aware of the nature of Pringles and other stackable chips, forget the idea that they come from actual potatoes in any perceptible way. The chips move forward on a conveyor belt until they’re pressed onto molds, which give them the curve that makes them fit into one another. Those molds move through boiling oil. After that, they’re blown dry, sprayed with powdered flavors, and at last, flipped onto a slower-moving conveyor belt in a way that allows them to stack. From then on, it’s into the cans and off towards the innocent mouths of the consumers. Furthermore, potato chips are notoriously high in this dangerous chemical. So high, in fact, that in 2005 the state of California actually sued potato chip makers for failing to warn California consumers about the health risks of acrylamide in their products. A settlement was reached in 2008 when Frito-Lay and several other potato chip makers agreed to decrease the acrylamide levels in their chips to 275 parts per billion (ppb) by 2011, which is low enough to avoid requirement for a cancer warning label. Think twice before consuming these kinds of food.